I'm always hesitant to use the word "epic" because it's such a subjective word (and honestly sounds boastful and competitive,) but when your 9-year old is shredding double black chutes at his new favourite ski resort, what else do you call it but "epic?!" Castle Mountain Resort is located in Southwestern Alberta, approximately an hour SW of the Town of Pincher Creek. Google maps says you can reach the resort in just over two hours from Calgary, but it would depend on where you live, because it's definitely closer to three hours from my house in the north. We stayed at the Castle Ski Lodge, a simple facility with hotel rooms upstairs, and hostel dorm rooms (three bunks per room to sleep six people) on the main floor. We had a hotel room with a queen bed and a set of bunks. While nothing fancy, our room fit a family of four (three in our case) and it beats driving all the way down and back in a day. And best of all, the lodge is located across the parking lot from the main resort so it's a very short walk to the lifts in the morning. Bring small bags you can carry up a flight of stairs! Big Bob, our giant hockey bag on wheels, was a bit heavy and thankfully my husband dragged him up! 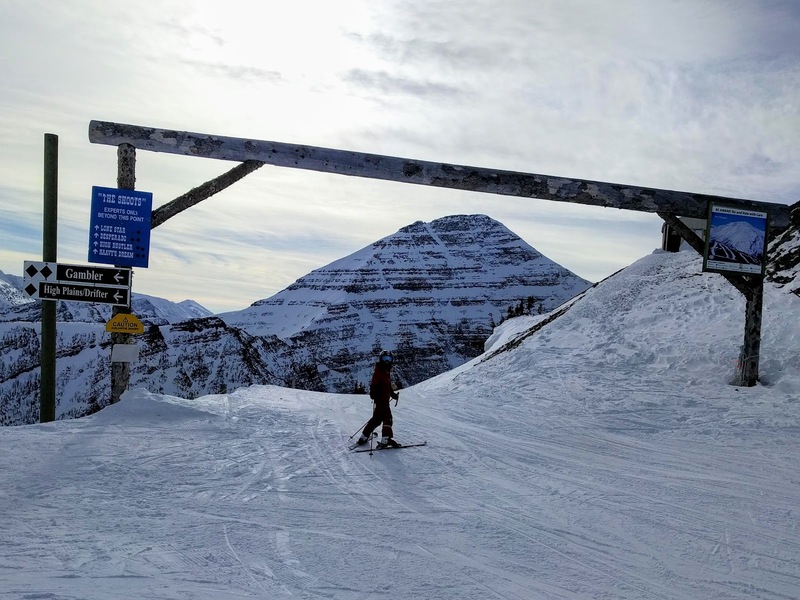 Otherwise, for families wanting to take it up a notch in their accommodations, there are other options available on the hill from a bed & breakfast to a ski in, ski out rental house, or a chalet on the hill with suites available for rent. Visit the Castle Mountain website to view all options. For pricing, follow this link and select either a hotel room or a hostel room. You can also view availability dates. There is not a "lot" of beginner terrain at Castle Mountain so this wouldn't be my first pick for a hill if you have young children just learning to ski or snowboard. That being said, if you have mixed levels in your family, each person will be able to find something that works for their abilities at this resort. True beginners can start off on the magic carpet until they are ready to advance to the "green chairlift." The Green Chair then accesses three short gentle runs at the bottom of the hill. This area was always full of families with young children and was very well used. 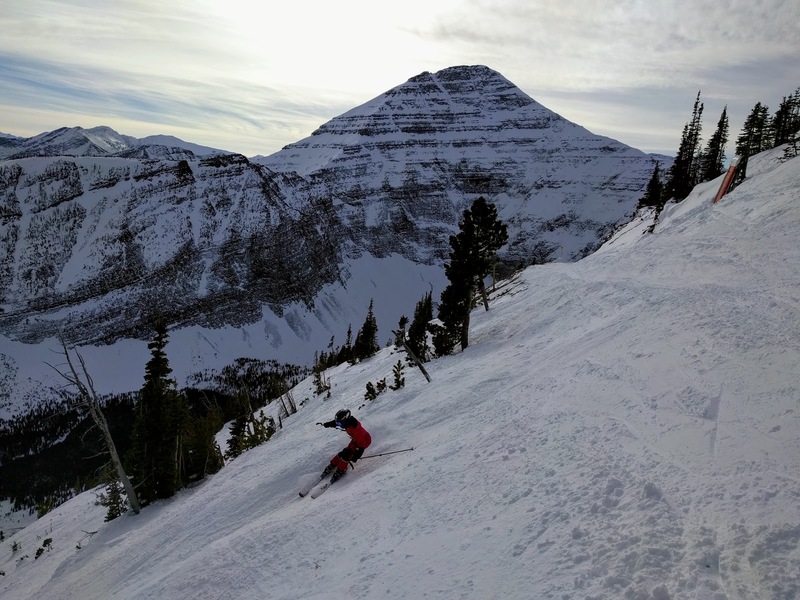 From the green chair, beginners have options off both the Huckleberry Chair or off the Sundance Triple Chair (the Blue Chair) where the North Run lazily winds its way down the mountain. I actually loved the North Run off Sundance and spent a lot of time cruising my way down here. It reminded me of the ski out at Sunshine Village (minus the flats where you have to skate ski) and was essentially a winding road down the mountain. Unfortunately, beginners can't access the top of the mountain until they're able to handle steeper terrain so Sundance will be as high as it gets for many families. I'm a competent skier and comfortable on all groomed terrain, but I still consider myself an intermediate skier. Fortunately I had several choices off every lift and was able to reach the top of the mountain for the best views! 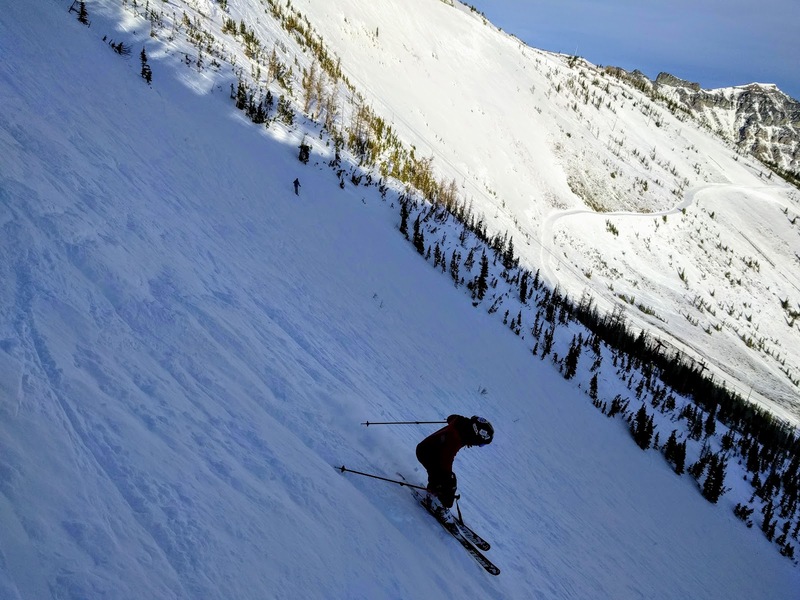 A true "intermediate" skier will want to start off on the Huckleberry Chair, a fabulous learning environment where nearly every run is groomed, and you won't accidentally find yourself on a black run. 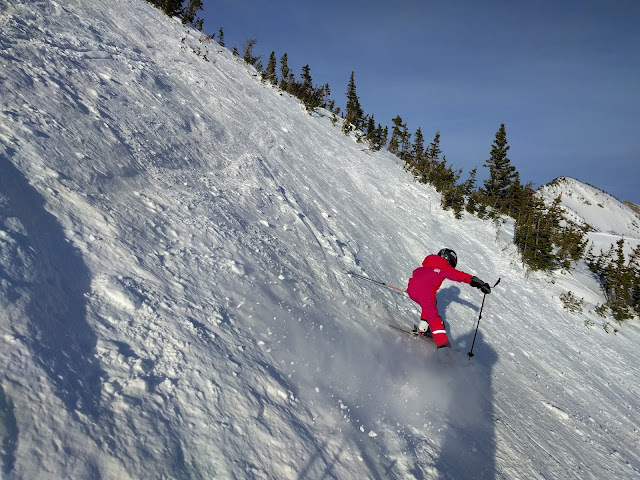 My boys did find some fun glades off Sidewinder, where there's also a terrain park when snow conditions allow, but other than that, the runs are relatively short and non-threatening. From the Huckleberry, progress to the North Run (mentioned above) or "Easy Street" both off the Sundance (blue) chair. Easy Street is basically a cat track that accesses other runs such as "Sundown" and "Twilight," a solid intermediate combination. Or, if you follow my husband, he'll take you down "Mouse Trap," the first groomed run you come across after crossing the "Centre Run" - but this is a black run and I can assure you it felt very steep for my first run of the day! Once you're comfortable on the Huckleberry and Sundance Chairs, make your way up the Tamarack Chair (the red chair) to the top of the mountain where the views (and hopefully not the winds) will blow you away on a clear day. If it's a windy day, stick to the terrain lower down. From the top of the Tamarack Chair, you'll find yourself on the Skyline Traverse as you make your way towards "Harkers Highway," the easiest way down. And honestly, this is pretty much a green run aside from the steep pitch at the top. Make it down that pitch, and the rest is a winding road. Note, look at a map first and make sure you take the Traverse towards Harkers Highway and not towards the double black chutes!! For more of a challenge, take the Skyline Traverse to "Bandito" or "High Noon." Each one has a short steep pitch but spits you back out on Harkers Highway lower down. 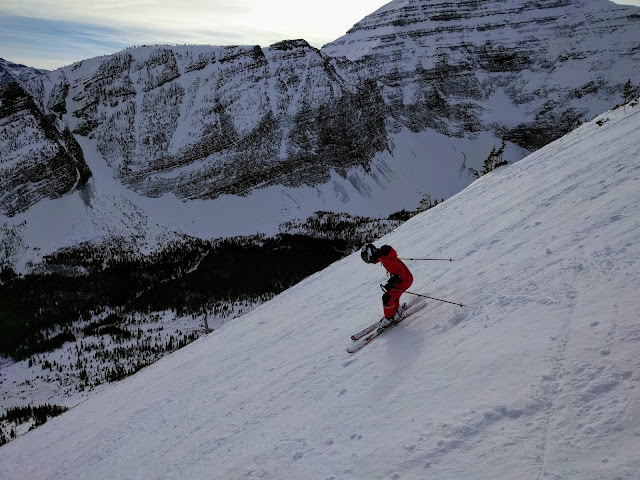 Try skiing in the Huckleberry Bowl (the opposite direction along the Skyline Traverse) - my boys really loved this bowl with its gentle angle. Alternately, try the Tamarack Bowl located right beside the Huckleberry Bowl. On a powder day, try Drifter, the first chute you'll come to just before you go through the gates into the double blacks. My boys found it to be ridiculously hard though and said you definitely need soft snow for it. 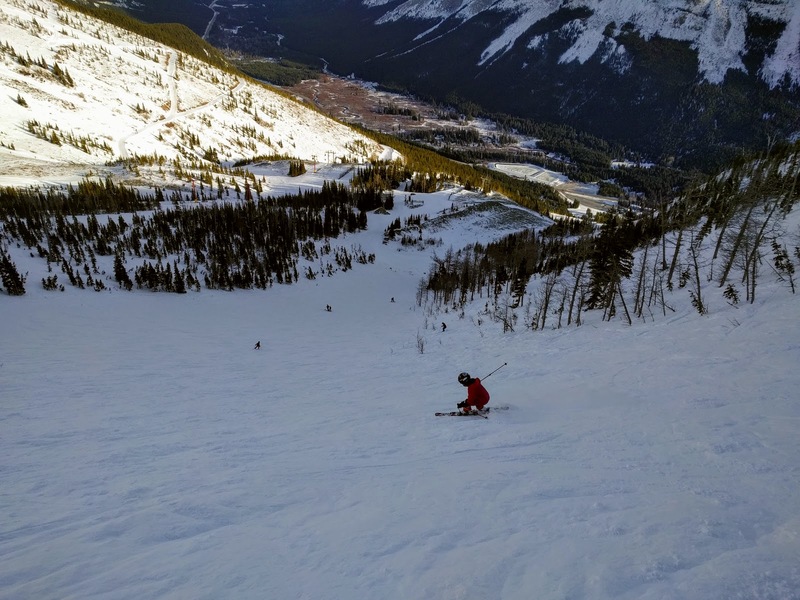 My husband and son joined a morning tour at Castle with one of the mountain snow hosts, and were taken into the chutes to experience Lone Star - with a 600 meter fall line, a consistent 37 degree angle, and the longest continuous fall line descent in Canada. Failing to get photos the first time, my boys chose to go back on Sunday to ski Lone Star again to get me the proof! Castle Mountain Resort is located adjacent to the new Castle Provincial Park where you'll find no shortage of activities to enjoy. Bring your XC skis, snowshoes, fat bikes, or ice skates and you'll have plenty of options. Beauvais Lake Provincial Park is also nearby with groomed trails to enjoy. Find more activities to enjoy here on the Castle Mountain Resort website. We got to try a preview of the Scenic Snow Cat Experience, and thoroughly enjoyed riding in one of the big snow cats! I highly encourage families to check this tour out - especially if you're not at the level to enjoy actual cat skiing. You'll enjoy the same views for a fraction of the cost as well and you'll enjoy snacks and hot beverages on the top of the ridge. Fill up with gas in Pincher Creek. The small gas station in Beaver Mines is not always open. Get free or discounted skiing if you have a Sunshine Super Card! Castle was added to the Sunshine discount card this year so if you have one of these cards, you can claim one of your free days at Castle. Otherwise, make sure you show your Sunshine Super Card for a discount if it's not one of your free days. - Castle Mountain really is "closer to heaven and down to earth" as the resort claims. There was an eclectic mix of people at the resort from the cowboy in his leather jacket, skiing in an authentic cowboy hat to the men we saw skiing in their work overalls, families who'd driven in from nearby farming communities, to groups of friends gathering for a fun weekend to ski or ride. I even saw a group of skiers in 80s retro ski wear You’d never see this mix of people at a resort in Banff. This is an authentic "locals' hill" operated by "skiers who are driven by adrenaline, not profit," and while you'll have to do without the high speed chairlifts you'd get at a bigger resort, in exchange, you get homemade monster size cookies baked fresh that morning, lifties that send you off with a huge smile and a shout to have fun every time you ride up, and some of the friendliest staff you'll find at a resort. Add, no crowds, no lineups, no parking problems, and a day lodge where you'll always find a table - and you've got Castle. And the 'Closer to Heaven" part will be experienced as soon as you ride the Tamarack Chair to the top of the resort and look around. These were some of the best views I’ve ever seen from the top of a ski hill on a bluebird day. Our weekend at Castle actually got us dreaming about looking for a house in South Calgary so this could become our local hill and about buying a vacation property in the area. 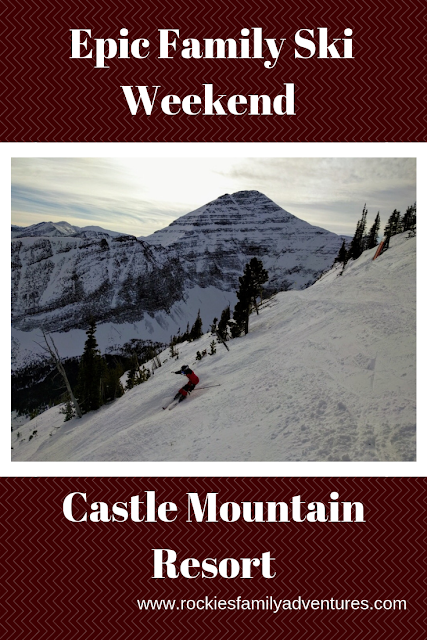 Disclaimer: We participated in a hosted weekend to experience a family ski weekend at Castle Mountain Resort. As always, all opinions are my own and I wasn't compensated beyond costs for the weekend. All you can do is have a great package and make the most of your trip. You need to choose the right set of people. Company plays an important role in the tour. If you have great friends your tour will be memorable for sure. We love Castle. We have only been there once but it was EPIC! We had a fab time as a family skiing here two years ago. Need to get back! Many people don't realize it's part of the Powder Highway.